A Trident II launch from a submerged Royal Navy submarine. The UGM-133A Trident II, or Trident D5 is a submarine-launched ballistic missile, built by Lockheed Martin Space Systems in Sunnyvale, California, and deployed with the US and Royal Navies. It was first deployed in March 1990, and is still in service. The Trident II Strategic Weapons System is an improved Submarine Launched Ballistic Missile with greater accuracy, payload, and range than the Trident C-4, strengthening U.S. strategic deterrence. The Trident II is considered to be a durable sea-based system capable of engaging many targets. It enhances the U.S. position in strategic arms negotiation with performance and payload flexibility that can accommodate active treaty initiatives (See New START). The TRIDENT II's increased payload allows nuclear deterrence to be accomplished with fewer submarines. Trident II missiles are carried by 14 US Ohio and 4 British Vanguard-class submarines, with 24 missiles on each Ohio class and 16 missiles on each Vanguard class. USS Tennessee (SSBN-734) was the first submarine to be armed with Trident IIs, and there have been 150 successful test flights  of the D5 missile since 1989, the most recent being from the USS Pennsylvania (SSBN-735) in February 2015. It is estimated that 540 missiles will be built by 2013. The Trident D5LE (life-extension) version will remain in service until 2042. The Trident II was designated to be the latest longer-range missile, performing greater than its predecessor (Trident C-4). In 1972, the US Navy projected an initial operating capability (IOC) date for the Trident II in 1984. The US Navy continued to advance the IOC date to 1982. On 18 October 1973, a Trident program review was administered. On 14 March 1974, the US Deputy Secretary of Defense disseminated two requirements for the Trident program. The first was an accuracy improvement for the Trident C-4. The second requirement asked for an alternative to the C-4, or a new Trident II missile with a larger first stage motor than the C-4. Studies were conducted to determine whether the more-expensive Trident II could be constructed similar to the US Air Force's MX ICBM. This was done primarily to decrease budget costs. It was established that the Trident II would be 83 inches in diameter and 44 ft in length in order to maintain performance with the existing MX ICBM. Modifications to the guidance system, electronics hardening, and external protective coatings were incorporated into the design. While this satisfied the US Naval study requirements, it did not accommodate the US Air Force payload requirements. Propulsion stages were proposed to be used between the first stage and second stage motors, effectively making the Trident II a longer three-stage missile than the C-4. Studies were delayed in 1978 when Congress only approved $5 million of the suggested $15 million for the Naval/Air Force program studies. By December 1978, the US Navy and Air Force studies agreed that the savings made by a similar missile structure would not be effective. It was determined that the US Navy and Air Force maintain and be responsible for their own unique weapon systems. The US Navy continued with their own weapon design of the Trident II. In March 1980, the US Secretary of Defense proposed an increased level of funding for the submarine-launched ballistic missile modernization. Emphasis was strained for the need of increased accuracy. The House Armed Services Committee (HASC) recommended no funding, while the Senate Armed Services Committee (SASC) recommended full funding of $97 million. The SASC asked for a plan which incorporates "the fullest possible competition... (and) should consider competing among contractors for each major component, including the integrated missile." $65 million was awarded for the submarine-launched ballistic missile modernization. On 2 October 1981, President Reagan called for the modernization of the strategic forces. 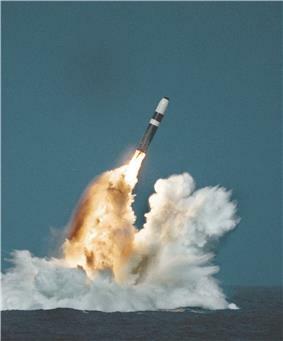 The Defense Department directed the Navy to fund all development of the Trident II D5 missile with a December 1989 IOC. All research and development effort would be directed toward "a new development, advanced technology, high accuracy Trident II D5 system." In December 1982, Deputy SECDEF Frank Carlucci advised Secretary of the Navy Caspar Weinberger to include funding for a new RV/warhead combination for Trident II. The reentry vehicle was to be designated as the Mk 5, which was to have an increased yield than the Mk 4. The development contract for Trident II was issued in October 1983. On 28 December 1983, the Deputy SECDEF authorized the Navy to proceed with Full Scale Engineering Development of the Trident II D5. The first Trident II launch occurred in January 1987, and the first submarine launch was attempted by Tennessee, the first D-5 ship of the Ohio class, on 21 March 1989 off the coast Cape Canaveral, Florida. The launch attempt failed four seconds into the flight because the plume of water following the missile rose to greater height than expected, resulting in water being in the nozzle when the motor ignited. Once the problem was understood, relatively simple changes were quickly made, but the problem delayed the IOC of Trident II until March 1990. US Navy test firing two Trident II D-5 UGM-133A missiles in the Atlantic Missile Range, on June 02 2014 (DASO 25 SSBN 736). Once the launch command is given, expanding gas within the launch tube forces the missile upward, and out of the submarine. Within seconds, the missile breaches the surface of the water and the first-stage Thrust Vectoring Control (TVC) subsystem ignites. This allows the missile to correct its position prior to first-stage motor ignition. Once the position is corrected, the first-stage motor ignites and burns for approximately 65 seconds until the fuel is expended. When the first-stage motor ceases operation, the second-stage TVC subsystem ignites. The first-stage motor is then ejected by ordnance within the interstage casing. Once the first stage is cleared, the second-stage motor ignites and burns for approximately 65 seconds. The nose fairing is then jettisoned, separating from the missile. When the nose fairing is cleared of the missile, the third-stage TVC subsystem ignites, and ordnance separates the second-stage motor. The third-stage motor then ignites, pushing the equipment section the remaining distance (approx. 40 seconds) of the flight. When the third-stage motor reaches the targeted area, the Post Boost Control System (PBCS) ignites, and the third-stage motor is ejected. The astro-inertial guidance uses star positioning to fine-tune the accuracy of the inertial guidance system after launch. As the accuracy of a missile is dependent upon the guidance system knowing the exact position of the missile at any given moment during its flight, the fact that stars are a fixed reference point from which to calculate that position makes this a potentially very effective means of improving accuracy. In the Trident system this was achieved by a single camera that was trained to spot just one star in its expected position. If it was not quite aligned to where it should be it would indicate that the inertial system was not precisely on target and a correction would be made. The equipment section, with the MIRV, then aims the reentry vehicles (RV) towards earth. The payload is then released from the MIRV platform. To prevent the PBCS correctional thrust from interfering with the RV when released, the equipment section initiates the Plume Avoidance Maneuver (PAM). If the RV will be disrupted by the PBCS nozzle's thrust, the nearest nozzle will shut off until the RV is away from the MIRV. The PAM is used only when a nozzle's plume will disrupt the area near an RV. The PAM is a specialized design feature added to the Trident II to increase accuracy. Guidance system: The MK 6 Astro-inertial guidance navigation system which is able to receive GPS (Global Positioning System) updates. Warhead (in USA usage only): The Mark 5 MIRV can carry up to 14 W88 (475 kt) warheads, while the Mark 4 MIRV can also carry 14 W76 (100 kt) warheads. START I reduced this to eight. New START provides for further reductions in deployed launch vehicles, limiting the number of Submarine-launched ballistic missiles (SLBM) to 288, and the number of deployed SLBM warheads to a total of 1,152. In 2014, another START Treaty will reduce the number of deployed SLBMs to 240. ^ a b c d e f g h Parsch, Andreas. "Trident D-5". Encyclopedia Astronautica. Retrieved 11 June 2014. ^ "The W88 Warhead, Intermediate yield strategic SLBM MIRV warhead". Retrieved 12 June 2014. ^ "The W76 Warhead, Intermediate Yield Strategic SLBM MIRV Warhead". Retrieved 12 June 2014. ^ a b c Parsch, Andreas. "UGM-133". Directory of U.S. Military Rockets and Missiles. Retrieved 2014-06-11. ^ a b "History Facts 2". Retrieved June 21, 2014. ^ a b "DEPARTMENT OF DEFENSE APPROPRIATIONS ACT, 1996 (Senate - August 11, 1995)". Retrieved 13 June 2014. ^ "Trident II (D-5) Sea-Launched Ballistic Missile UGM 133A (Trident II Missile)" (PDF). Retrieved June 21, 2014. ^ Fisher, Lynn (13 June 2014). "Trident II D5 Missile Reaches 150 Successful Test Flights" (Press release). ^ "UGM-133 TRIDENT D-5". Missiles of the World. missilethreat.com. Retrieved 2012-11-23. ^ "Remarks and a Question-and-Answer Session With Reporters on the Announcement of the United States Strategic Weapons Program". National Archives and Records Administration. Retrieved 2014-12-24. ^ Popejoy, Mary. "USS Alabama Offloads Last of C4 Trident Missiles". Retrieved 21 November 2013. ^ a b "Trident I C-4 FBM / SLBM". Retrieved June 13, 2014. ^ a b c "Trident II D-5 Fleet Ballistic Missile". Retrieved June 13, 2014. ^ "TRIDENT II (D5) DIMENSIONS AND JOINTS". Retrieved June 13, 2014. ^ a b "Santa Cruz Facility Brochure" (PDF). Retrieved June 23, 2014. ^ "Lockheed Martin UGM-133 Trident II". Retrieved December 12, 2013. ^ "Lockheed UGM-96A Trident I C4/UGM-113A Trident II D5". Retrieved December 12, 2013. ^ "Fact Sheet on U.S. Nuclear Force Structure under the New START Treaty" (pdf).